I am so excited to set my table this Easter! 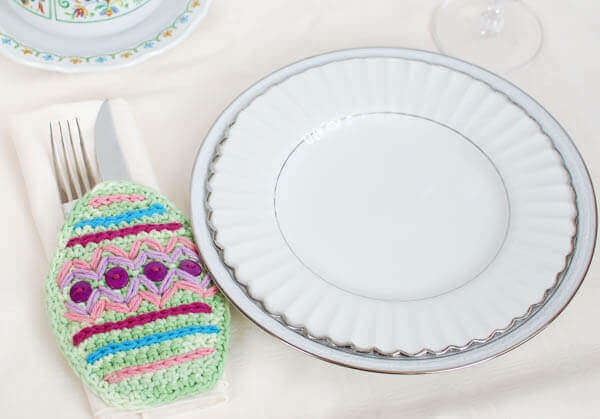 I designed this crochet Easter Place Setting Pattern and just love how it came out!! I worked up a bunch in different colors and had so much fun decorating each one. I used buttons and some contrasting stitching here but there are so many options you can use too … ric rac, beads, etc. I even stitched on a little back band to hold a napkin and utensils. These would even be great as coasters too! Add pattern to your Ravelry library. Row 1: Work 1 sc in 2nd ch from hook and each ch across, turn — 8 sts. Row 2: Ch 1 (does not count as st here and throughout), work 2 sc in first st, 1 sc in each of the next 6 sts, 2 sc in last st, turn — 10 sts. Row 3: Ch 1, work 1 sc in each st across, turn — 10 sts. Row 4: Ch 1, work 2 sc in first st, 1 sc in each of the next 8 sts, 2 sc in last st, turn — 12 sts. Row 5: Ch 1, work 1 sc in each st across, turn — 12 sts. Row 6: Ch 1, work 2 sc in first st, 1 sc in each of the next 10 sts, 2 sc in last st, turn — 14 sts. Row 7 through 11: Ch 1, work 1 sc in each st across, turn — 14 sts. Row 12: Ch 1, sc2tog, 1 sc in each of the next 10 sts, sc2tog in last st, turn — 12 sts. Row 13: Ch 1, work 1 sc in each st across, turn — 12 sts. Row 14: Ch 1, sc2tog, 1 sc in each of the next 8 sts, sc2tog in last st, turn — 10 sts. Row 15: Ch 1, work 1 sc in each st across, turn — 10 sts. Row 16: Ch 1, sc2tog, 1 sc in each of the next 6 sts, sc2tog in last st, turn — 8 sts. Row 17: Ch 1, work 1 sc in each st across, turn — 8 sts. Row 18: Ch 1, sc2tog, 1 sc in each of the next 4 sts, sc2tog in last st, turn — 6 sts. Row 19: Ch 1, sc2tog, 1 sc in each of the next 2 sts, sc2tog in last st, turn — 4 sts. Row 20: Ch 1, sc2tog twice, fasten off — 2 sts. Row 1: Work 1 sc in 2nd ch from hook and each ch across, turn — 14 sts. Rows 2 through 5: Ch 1, work 1 sc in each st across, turn — 14 sts. Fasten off leaving a tail of approximately 6 inches. Now is your chance to have lots of fun! 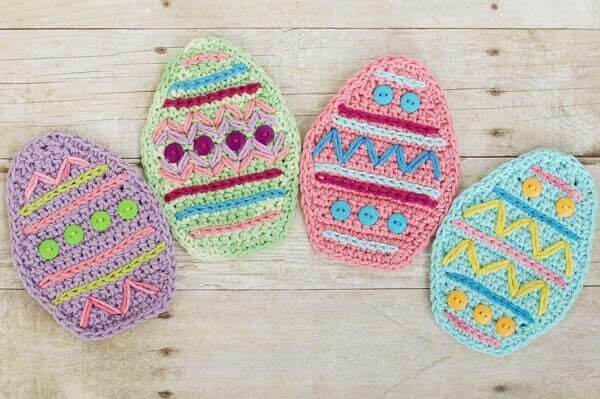 Decorate your eggs to your heart’s content … embroider, add some buttons, glue on some ric rac … there is no limit to what you can do! 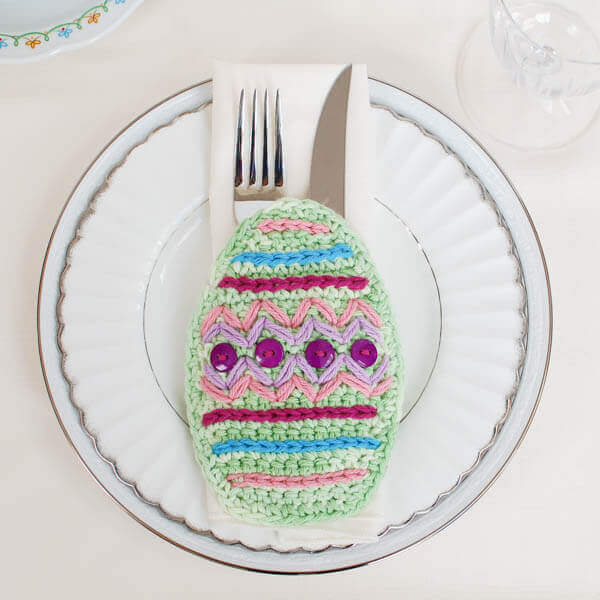 Once you have your egg decorated, use a tapestry needle and the long tail left on your back band to sew the band to your egg. 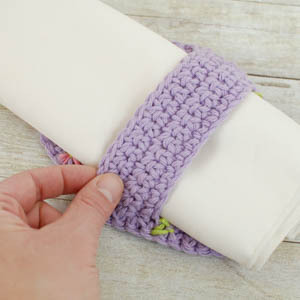 Stitch together at the edges of rows 7 through 11, weave in ends. With the right side of your work facing you, work a sc edging evenly around the egg, working 2 sc at each of the bottom corners of the egg. Very neat! I love adding little things all around the house for the different holidays. This place setting is a nice addition. Pinning. So pretty! Thanks so much or sharing. These are adorable! Will certainly try them. Buen día. Es precioso. pero no puedo hacerlo, pues a mi me cuesta entender los patrones, por esto, le agradecería si pudiera poner los gráficos o vídeos. These are so cute, love them! 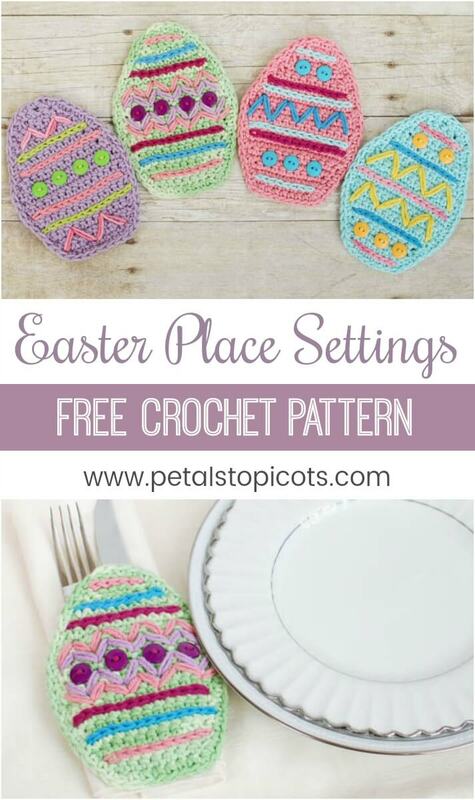 Perfect for Easter!